The Mercury in Scorpio people are interested in what is going around them all the time. There is no more intuitive zodiac sign in astrology than Scorpio. Their ability to observe and instantly know what’s happening around them is unmatched. 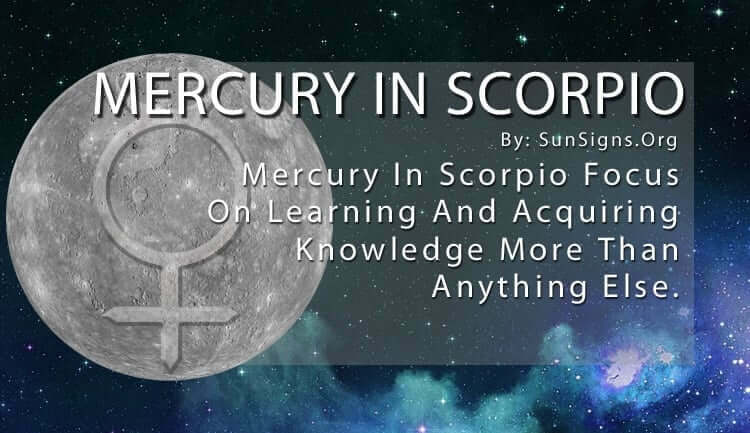 So with Mercury in Scorpio, their big thing is acquiring knowledge. But not just facts and figures. They are looking to get to the center of everything. Planet Mercury symbolizes interaction, learning, decision-making, logic, and reasoning. For Mercury in Scorpio, they focus on learning more than anything else. They absorb every detail of their environment and those around them. They can size up a situation almost immediately. They can read others like a book while revealing very little about themselves. This doesn’t mean they aren’t passionate people. As a water sign, the Scorpio Mercury people are extremely passionate about everything in their life. They don’t show others, how important things are to them. They would rather die than have someone find out what they’re thinking. This is part of their strategic mindset. Mercury in Scorpio is always contemplating their next move and the moves of others. They are always ready to compete. Whether with different individuals or themselves, they strive to come out on top every time. It’s because they assume the worst that they are ready for anything. Their pessimism allows them to be prepared for whatever comes their way. They are calm and collected that people. Often, they have no idea the kind of chaos going on underneath the stone exterior. And that’s just how they want others to perceive them. Mercury in Scorpio will go to great lengths to ensure that no one, not even those closest to them, can see into the depths of their soul. When the Mercury in Scorpio communicates, it’s usually to give advice or help others with their problems. If people ask about their lives, they reveal very little. They will only tell people what they want them to know. And, hide everything else deep down inside their core. The term poker face fits this star sign perfectly. This can be frustrating to some people who have a more optimistic outlook on life. But Scorpio wouldn’t have it any other way. They usually understand why individuals do things better than the person does. So, they feel obligated to anticipate every possibility that could lead to. This can be exhausting sometimes, but Mercury in Scorpio are highly intellectual and more than capable of handling the stress. It’s simply confusing to other people why they put so much strain on themselves in the first place. The Mercury in Scorpio will say whatever is necessary to avoid any personal confrontation or questions. All the focus will be on other people and giving them sage advice. They like to keep the spotlight off of themselves. This doesn’t mean that they don’t care about their social circle. They are fierce when it comes to defending their own. They will go to the ends of the Earth to protect their loved ones from harm. But when the tables are turned, and things come back to them, they will deflect the attention to somewhere else. It can be tiring hanging out with this Scorpio, for you never fully understand what’s going on with them.